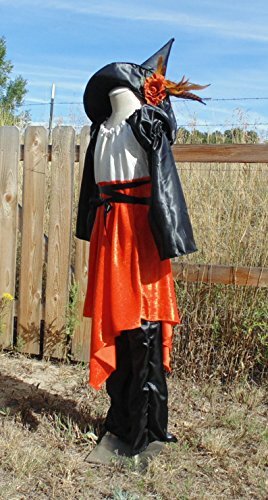 Cute Girls Witch is made with elastic at the neck and arms and ties around the waist for adjustment for sizes from 10-14. dress has a handkerchief hem and is about 30 inches long from top of shoulder to shortest part of the hem and 44 to the longest. Dress is worn over black satin pants that have an elastic waist. I added some Crocheted belt loops on the sides to help keep the matching ribbon in place. Matching Satin Hat is made fit pretty far down on the head, and the hat will fit an adult. Hat has matching band and rooster hackle feathers with rose and beaded accent. please let me know if there are any questions!